The First of the New Generation CradleKits! We are delighted to offer the all new CradleKits incorporating some special design features. The very high standard of German vinyl is still there along with the German made cloth bodies. What we have done is soften the vinyl, especially for the limbs, and introduce a whole body torso in CradleSoft vinyl. The great thing about this new design is that we have also included a fully jointed cloth body to go on the inside of the soft vinyl body. 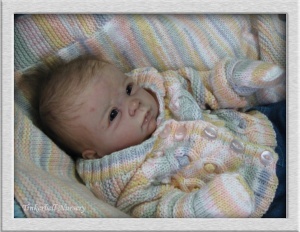 That way you have complete posing control and still have a lovely, snuggly baby.The cloth body is made in skin tones to blend with the vinyl and the joints are our normal, high quality, cotter pin joints. The best of both worlds! 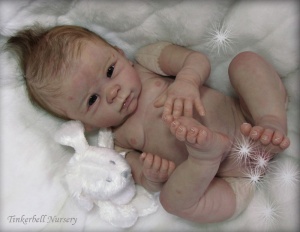 Being able to have a realistic weighted baby with full posing ability is essential. This combination of cloth and vinyl bodies means that they will not fall apart and you will be able to handle and cuddle them with complete confidence. You can fill them as you would a normally without fear or concern of doing damage. We hope you will be as thrilled as we are when you meet your first New Generation CradleBaby and hold her in your arms. 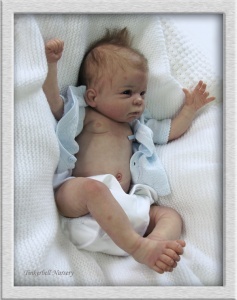 The photographs show Dani reborn and completed by Helen Jalland. 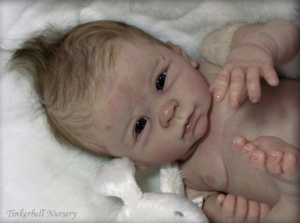 Dani will come to you as an unpainted vinyl 'kit' that will required full reborning. 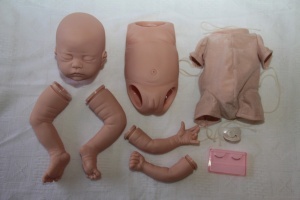 Your are buying a 'doll kit' that will require the full rebornng process. These pictures are of how this beautiful sculpt 'could look like once reborned.